Did you ever have one of those label makers? The kind with a rotating wheel that embossed a plastic ribbon with letters that you could stick to things? Labeling is so easy! I often feel constrained, however, by the chosen labels of extremist groups. Not all evangelicals are power-hungry or enemies of human welfare. This is perhaps one of the keys to the success of extremists. Camouflage has long been recognized by evolution as a most effective tactic. I have many evangelical friends who do not protest cartoons, or ride around in Trump-laden vehicles, polluting the environment like there’s no tomorrow. The problem is what to call them since the more radical wing has usurped their nomenclature. I often think of this because I eschew labels in general, but people in a collective can do quite a bit more damage than a single disgruntled individual. Perhaps “disgruntled” should be part of their name? Religions generally begin as efforts to help make the world a better place. The historian of religions sees, however, that over time many believers begin seeing the peripherals as the central tenets of the faith. Since I’m familiar with evangelicalism, let me use that as an example. As a form of Christianity, evangelicalism began with the Reformation. Pietist groups, freed from Catholicism’s idea of communal salvation, began to worry about their individual souls and how they might be saved. Their belief structure eventually came to include the necessity of converting others because, if you read the Bible a certain way, that’s a requirement. Over time this outlook evolved into the idea that only one group (one’s own) has truly understood the Christian message. Once numbers grow numerous, it becomes like the medieval Catholic Church—large enough to take political power. Somewhere along the line the central message of helping make the world a better place morphs into making the world evangelical only. Or whatever label we feel constrained to use. I’m not picking on the evangelicals here—this could apply to any extremists. And it certainly doesn’t apply to all evangelicals. Religion has been part of human culture from the very beginning. A good case can be made that it is one of the basic components of consciousness itself. A person has to learn how to become unreligious. We are also political animals. Who doesn’t want things their own way? We can’t all win, however, and some religions have difficulty separating, say, a savior willing to die for others and the insistence on one’s own way no matter what others want. Like most aspects of life this is a balancing act. I grew up evangelical. I have friends who are evangelical. I don’t want to insult anybody, but what can you do when you feel disgruntled by the degradation of religion into an excuse for hate? I lost my label maker long ago and I no longer know what to call things anyway. I don’t have any bumper-stickers on my car. As clever as I may think any particular one to be, driving down the highway is not the place that I want other drivers to get ticked off at me. A more judicious use of turn-signals would be my preference over mass-produced witticisms. I suspect that most readers know of my liberal leanings. Some have even bothered to inform me that they no longer read my musings precisely because of this. On the information superhighway, unlike the real highway, you can just click off and not be annoyed anymore. My bumper, therefore, will stay clean. 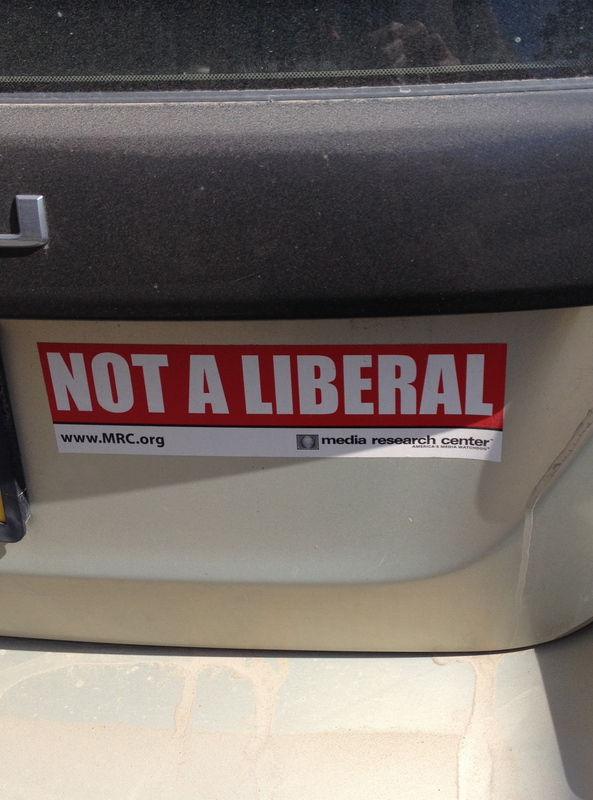 While in a parking lot recently I saw a bumper-sticker reading “Not A Liberal.” I had to ponder this a bit. I grew up conservative, although, as working-class folk, we didn’t label ourselves with that word at home. I wouldn’t have even known what it meant. Liberal, in its basic form, has to do with generosity and being respectful of others. The media has built it up into a kind of evil juggernaut that intends to take over the safe, unchanging world of religion and politics. I wonder how liberal became a dirty word. Who, among your friends, would want to remain so if you disrespect their views and refuse to show generosity? I get the sense that even conservatives are liberal with their friends. When I walk past the homeless sleeping on a subway vent to keep warm, I wonder if conservatives ever read the parable of the good Samaritan. What bumper-stickers would the homeless wear? A polarized society had better prepare for the big chill. In my admittedly limited experience, people come in a continuum of positions, not just one extreme or the other. It makes better news, however, when we divide into camps, the more clearly to spar with one another. What separates us is more important than what brings us together. Yes, I grew up conservative. I continued, however, to grow up. I suspect in some things I am still conservative, while in many I am liberal. I’m not sure what I’d put on my bumper-sticker. What do I want people to know about me while I’m driving? I think it might be better to suggest “I Respect You,” than an implied “I don’t like your views.” Then again, since it happens so often, I now look for a Jesus fish automatically when I’m cut off in traffic. Be careful of what you put on your bumper, because dirty words are in the eyes of the reader. Labels. They can be problematic. Given our human brain structures, we are predisposed to patterns and categorization. Is it edible or not? Predator or prey? Like me or different from me? We constantly scan our world, categorizing as we go, holding our people, experiences, and places in a temporary, floating mode of immediate recognition. I’ve had people who read my blog ask me, “What are you?” My guess is that they want a simple, pat answer: Christian or not, religious or not, dangerous or not. The more specific the better, since the more precise the label the better fit the box we stuff you into will be. Given the trajectory of my unorthodox career, it is common for me to be labeled as “theologian.” It is a categorization I deny, but since the study of ancient texts and myths generally falls under the rubric of “theology” it is not entirely inappropriate. I prefer to leave theology to those more intelligent than myself. It is with great joy, therefore, that a new blog has emerged from a worthy theologian. Bleak Theology makes its premiere today. I have known the talented writer, Burke, for some time. And I know that some fantastic things will appear on this blog. In its own words: “Bleak theology is anxious, but not despairing. It is pessimistic, but not hopeless. It is materialistic, but not idolatrous. It doesn’t always have hope, but it certainly would like to have that hope… It’s a theology that gazes troublingly up at Mt. Moriah; that sits in sack and ashcloth and resists cursing God and dying; that cries out that everything is meaningless (meaningless! ); that sits by the rivers of Babylon and cries; that staggers away from the crucifixion disillusioned; and, after seeing the stone rolled back and the dead vanished, leaves the tomb and tells no one.” We have great things to anticipate. Melancholy is its own variety of joy, as some of us are continually discovering. Labels. Some people make a lot of the alphabet soup one is legitimately able to put after one’s name. A friend once told me that he’d heard a Ph.D. insist on being called “Doctor” by the attendant when he pulled into a gas station. I have a label for such people, and it fits better than the one they prefer. I have known and worked for Ph.D.-bearing individuals who just as dumb as the rest of us. Sometimes even more so. Theology is not a discipline where advanced degrees are required, for either those who have them or those who don’t. The fact is we’re all thrown into this same world together and, like it or not, no one has the answers. Some may don their papal tiaras or their fancy academic robes with striped sleeves, and claim hegemony, but the truth is we are all seekers. The best company one might hope to find is with the person who honestly struggles. Embrace bleak theology and eschew easy classification. There may be no hope for us yet.